The first version of FarsiDic.com Mobile is optimized for iPhone but if you use different type of mobile phone you can try the web address above and let us know if there is any issue using the mobile site on your phone by sending Feedback. 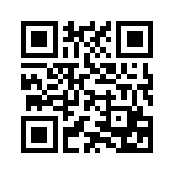 Type http://FarsiDic.com/M on your phone browser or if you have a barcode scanner app simply scan the barcode below (QR Code). Select “Add to Home Screen”. This will create an icon on your iPhone home screen and next time you can launch the FarsiDic.com Mobile by touching on that icon. In order to type Farsi in Farsi to English mode you would need use the Arabic keyboard built in iPhone. After setting up the keyboards whenever the keyboard is open you can switch between English and Arabic keyboard by touching the Globe icon (2nd key from left on the bottom).